The early frontiersmen lead difficult, backbreaking struggles as they migrated west to start anew. The pioneers had a perilous journey, and judging from Meek’s Cutoff, they had a hard time asking for directions. We follow a wagon train hopelessly lost in Eastern Oregon, blindly hoping they are getting ever closer to water. This awful movie feels about as adrift as the characters. Director Kelly Reichardt (Wendy and Lucy) recreates pioneer life in obsequious detail, which means that for most of the interminably long 104 minutes we’re watching characters walk. And walk. And walk. Hey, now they’re doing something, nope back to walking. Michelle Williams (Blue Valentine) has the most personality of this taciturn bunch, but I couldn’t have cared less about her lot. The movie is practically indignant about the narrative demands an audience has for its movies. This is not some arty examination on the treacherous nature of the human spirit, or some conceited claptrap like such. 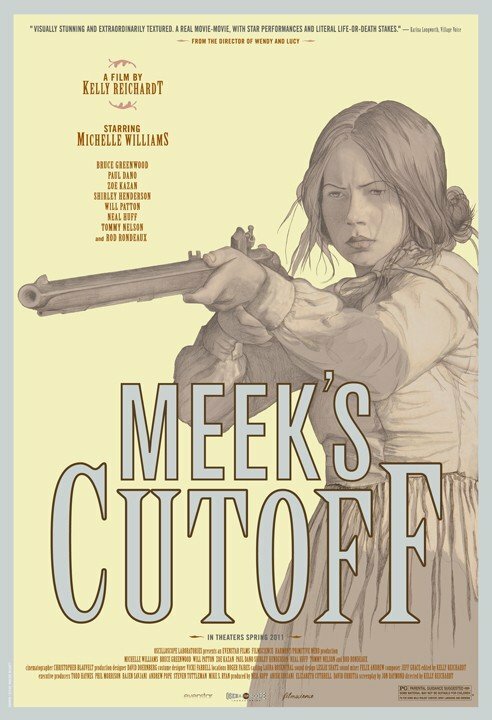 And in a growing trend of 2011 Sundance films, Meek’s Cutoff ends absurdly abrupt, just as the characters appeared at a crossroads and on the verge of mercifully doing something interesting. Instead, Reichardt ritualistically kills the movie on this spot, robbing the audience of any payoff after 104 minutes of fruitless and tiresome artistic masturbation. If I wanted to watch a recreation of frontier life without any regard to character or story, I’d watch the History Channel. This is an exasperating, maddening, crushingly boring movie that makes you feel trapped on that misbegotten wagon train. Posted on December 8, 2011, in 2011 Movies and tagged bad movies, bruce greenwood, drama, kelly reichardt, michelle williams, paul dano, period, pretentious, western, zoe kazan. Bookmark the permalink. Leave a comment.